Hot on the heels of their awesome video “#Unconstitutional” comes another excellent piece by the Republican National Committee which absolutely lays waste to the Obama-Clinton immigration overreach. 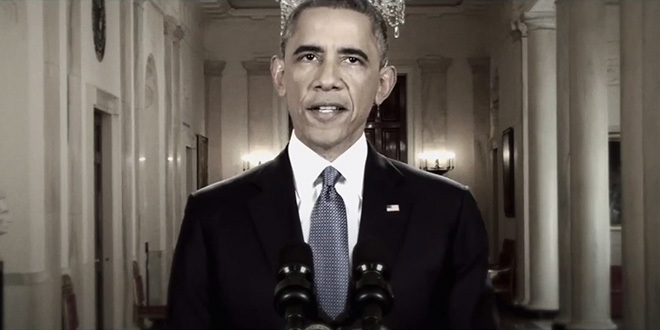 This latest video features footage of President Obama from his November 20th “amnesty” speech (slowed down to make Obama look extra creepy) coupled with a voice-over by Hillary Clinton. The Hillary audio is taken from an April 2008 speech in which she made comments criticizing former President George W. Bush for running an imperial Presidency. At the end of the video, it is revealed that Hillary, of course, magically supports President Obama’s overreach of executive authority on the issue of amnesty. It is liberal hypocrisy at its finest.